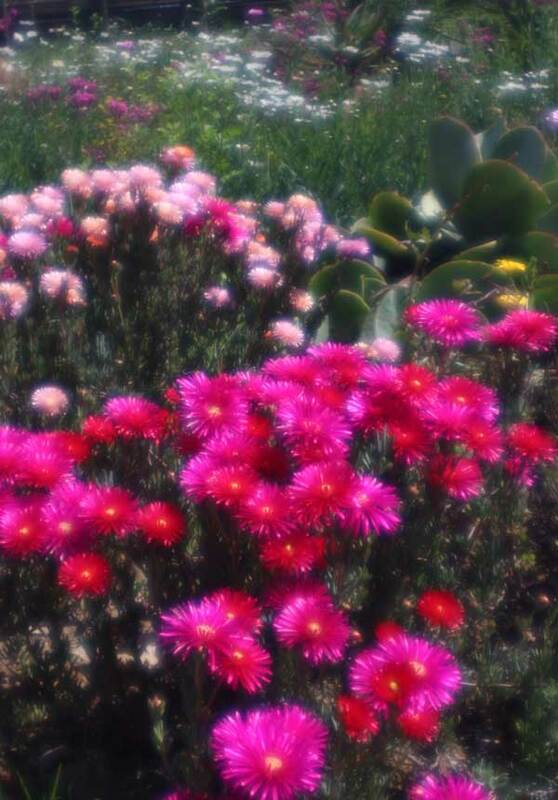 The vibrant colors of these indigenous garden flowers are certainly eye-catching in their Spring finery, particularly the startling reds and shimmering pinks of the Lampranthus in the foreground. Normally one would not photograph such flowers in the harsh midday African sun — except of course if you’re using a plastic Diana lens. Diana lenses, traditionally used by adherents of Lomography, are known for their low saturation, soft surreal blurs, and unpredictable colors. But if the subject is already low in contrast, with muted colors, the Diana can render it too flat and desaturated. I wanted to retain the vibrant colors, but soften and blur the details, which the Diana did remarkably well in the bright, contrasty lighting of the midday sun. The Diana+ 38mm Super Wide Lens is designed for use on medium format film cameras, where it yields a 120° angle of view (roughly equivalent to a 25mm lens on a 35mm camera). So what’s the approximate focal length when fitted to a digital SLR? According to the Lomography site: "When used on a 35mm SLR camera, the Diana+ 38mm Super Wide Lens is equivalent to a 72mm lens. Used on a APS-C sensor DSLR it has the effect of a 115mm telephoto lens!". Now I don’t know if the custom Canon adaptor makes a difference to this, but when I tested the Diana against a Canon EF-S 18-55mm kit lens on my APS-C camera (Canon 450D), the Diana provides the same angle of view as does the Canon lens at 39mm, which is roughly equivalent to 62mm on a full-frame camera — in other words, pretty close to a standard lens. See also this blog post, Dreamy Diana Lens on Canon Digital SLR.